Graphs at a glance: Is the national debt being paid off? Cameron says yes but the independent Office of Budget Responsibility says it is actually increasing! 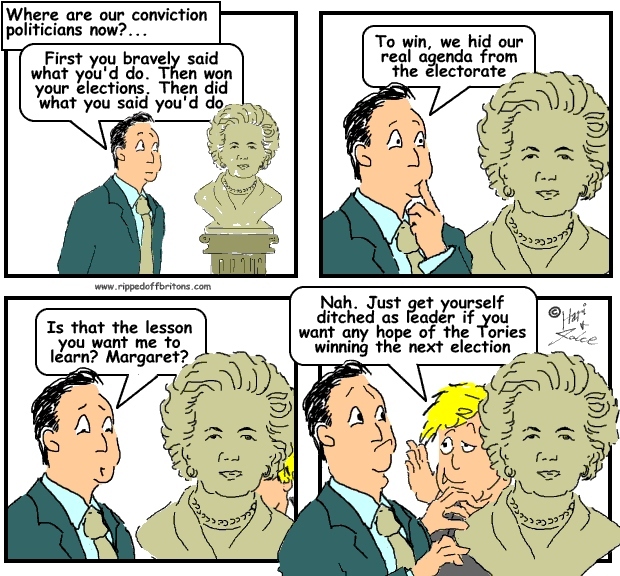 We at Ripped-Off Britons don't think much of politicians generally. But we try to give them the benefit of the doubt if we can. When David Cameron, in his speech to the Tory Party Conference in October 2014, said we are "a country that is paying down its debts", was he fibbing or (giving benefit of the doubt) did he actually believe it? The Tories had already made this statement in 2013, and were politely slapped down by Sir Andrew Dilnot pointing out that the national debt, far from being paid down, had continued to rise. Cameron, making the same false claim at the 2014 Tory Party Conference, got virtually the same telling off from Sir Andrew with the figures updated to reflect the passage of time since the previous rebuke. Figures showing that the £1,111.4 billion debt of December 2012 had increased to £1,432.3 billion by August 2014. Why do politicians repeat fibs when they know they will be pointed out by independent credible people? Either it is because they think we, the electorate, are too stupid to understand, or it is because they are too stupid to know they are fibbing. So, what would you prefer? 1) A Prime Minister who has so little respect for the electorate that he comes up with precisely the same fib year after year? 2) A Prime Minister who is so economically illiterate that he actually believes the country is "paying down its debts"? 3) A different Prime Minister? Why not use simple words and say "This is how much bigger our debt gets each of these years, and to see the total debt we must add all these sums to the 2010 figure of £1.1Trillion"
Total debt is not the same as 'deficit', and politicos interchange these words williy nilly! "Public sector net debt excluding public sector banks (PSND ex) was £1,451.3 billion (79.9% of GDP) in September 2014, an increase of £100.7 billion compared with September 2013." I knew this most reading this already knew it yet Labour did nothing either during 5 years in opposition to burst coalition lie bubble. And even seemed to accept blame fore 2007 financial crisis no wonder there was cheering in the dealing floors of the city when the Tories returned as government! They knew they had got away with it!